Hey friends! 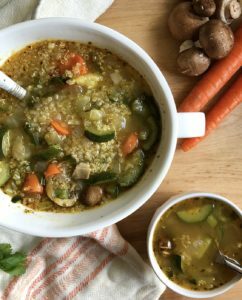 Today, I bring you a super simple and delicious hearty quinoa veggie soup. Its super healthy, full of nutrients and both dairy and gluten free. I’ll be honest, I never liked soup growing up. To me, it was extremely boring and seemed to only be eaten when sick. I also was under the misconception that soups were really hard to make which is totally false. Now, I often make soups and I enjoy them at all times of the day and in all seasons. Just because its summer, doesn’t mean you cant enjoy the comfort of a warm bowl of soup! Add the olive oil to a large pot. Add all the veggies except the cilantro and mushrooms. Saute for 5-8 minutes. Add in all the seasonings. Saute another 2 minutes. 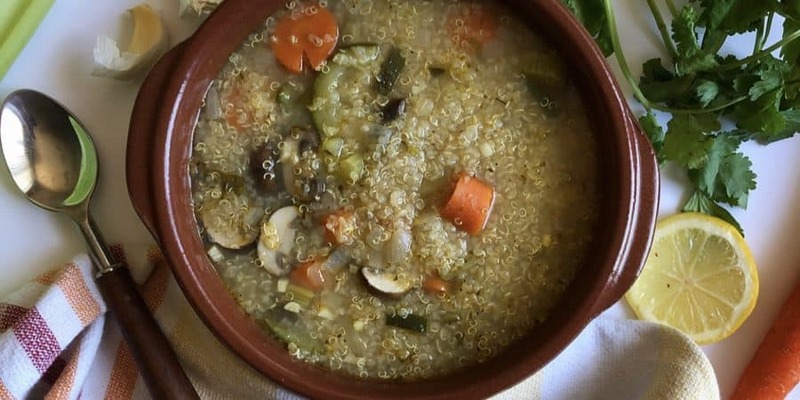 Then add the quinoa, vegetable stock and bay leaves. Season generously with black pepper and salt. If using a bouillon cube then watch how much salt you add to the soup. You can always adjust later. Bring the soup to a boil then allow to simmer for about 20-25 minutes. Fifteen minutes into cooking the soup, add in the mushrooms. Check to see if quinoa and veggies are fully cooked after 20 minutes. Take out bay leaves before serving and add the fresh lemon juice and cilantro. Serve warm.